By now you should know that it's (almost) never aliens. Still, earlier this week, Russian cosmonaut Anton Shkaplerov told the Russian state news agency TASS that he had collected bacteria from outside of the International Space Station (ISS) that was from "outer space" — meaning that it's of alien origin. When contacted, the Russian space agency Roscosmos did not refute Shkaplerov's claims. Instead, it shared two previous stories from TASS, one of which stated that the exterior of the Space Station might serve as a "temporary custodian of biomaterial of extraterrestrial origin." By this rationale, perhaps bits of space rock or dust from a comet containing alien microbes could have smacked against the station — and stayed there. It's certainly likely that Shkaplerov, while taking a cotton swab of the Space Station's exterior, picked up a bunch of dead microbes. It's just that these microbes almost certainly came from Earth. "All the pieces that went into the ISS were contaminated," Seth Shostak, a senior astronomer at the SETI (Search for Extraterrestrial Life) Institute, told Mashable. "Inevitably, they’re contaminated." If Roscosmos and its cosmonauts still want to prove this wild alien claim, however, they still have an opportunity. The space agency could inspect the microbes for a tell-tale sign of Earthly origins: double helix genetic material. 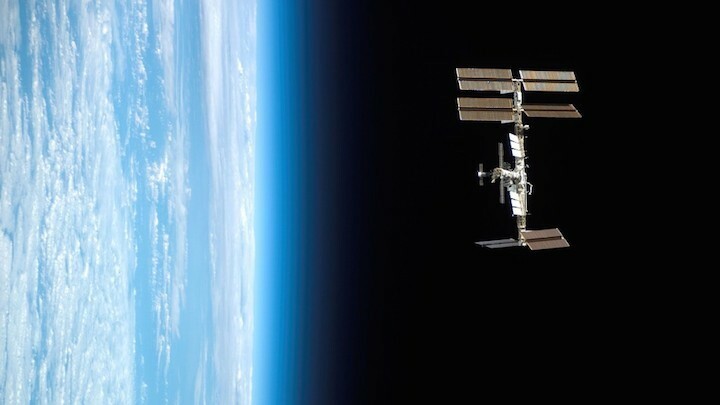 "All the pieces that went into the ISS were contaminated." "This story would be credible if they scraped off some of that 'pond scum' and determined that it didn’t have DNA," Shostak said. "Otherwise, how do you know it's not just stuff from Earth?" NASA expressed little interest in joining the commentary on whether or not the cosmonaut had discovered alien life outside the Space Station. A NASA representative said that Roscosmos would be the "appropriate people to discuss this topic since the reported findings would be based on their analysis." Curiously, the TASS article also stated that "some terrestrial bacteria also survived on the Space Station’s external surface," so it's not as if they're claiming that Shkaplerov took a swab of exclusively alien creatures. Shkaplerov will have another opportunity to sleuth out extraterrestrial microbes on the station's exterior. The cosmonaut is scheduled to blast back off to orbit on Dec. 17, where he will serve as the "head of the Space Station’s new crew," TASS added. An astronaut waving from outside the International Space Station. While Shkaplerov's claims might sound somewhat absurd, it doesn't mean hardy microbial life can't be found in our very own solar system. SETI's Shostak says there are a half-dozen places in our solar system that have liquids, places like Saturn's moon Enceladus which shoots out plumes of ice and water vapor. "Liquids have been sitting there for a long time — billions of years," says Shostak. "I’m willing to bet at least one of them have cooked up biology." He's simply not convinced that life only evolved in Earth's waters. "Maybe Earth just lucked out, and that would make us special," he says. "But we’re probably not that special."